A recent survey conducted by Texas A&M University asked consumers how important animal welfare was to them when buying meat. A total of 69% of recipients said that animal welfare is at least somewhat important, 22% said it was very important and 11% said it was extremely important. Consumers respond when groups such as Mercy for Animals go undercover to show them how the animals slaughtered for meat are treated. So one would think the common sense thing for those working in animal agriculture to do would be to appeal to the sensibilities of the consumer and create a more humane living and dying environment for those animals. Instead, the animal agriculture industry is trying to make it illegal for you to know how the animals killed for food are treated by passing ag-gag laws in state legislatures. These laws are designed to make it illegal to do what groups like Mercy for Animals do- show you where your steak, chicken and bacon REALLY come from. In Kentucky, animal agriculture was responsible for tacking on an ag-gag amendment to a bill setting euthanasia standards for animal shelters. And Idaho’s recently passed law is being challenged in the courts as interfering with our freedom of speech. And there are other dirty little tricks they play. Animal agriculture tries to charge more for pork and poultry labeled as “hormone free,” when ALL chicken and pork are hormone free. The USDA prohibits the use of hormones in chickens and pigs. And then there’s the meat labeled “all natural,” which means nothing, as there are no set industry standards for such labelling. Add it all together, and it’s easy to see that eating meat supports an industry that isn’t the least bit interested in serving the needs of its customer. No, all it’s interested in doing is making a buck at the expense of animals. 100% True! Thank you for bringing this travesty to the attention of those readers who didn’t already know it. And for those of us meat-eaters who think Whole Foods is an alternative, be warned. While you can indeed find cruelty free meat at Whole Foods, if you don’t take great care in reading the labeling, you may be inadvertently supporting a factory farm. Whole Foods does sell both, and their labeling can be misleading. Publix does the same with its Greenwise label. When I was 16, I worked for 4 hours at a meat packing plant. In fact, it was the largest meat packing plant in the world, formerly Monfort of Colorado, now owned by some conglomerate. The first 3 hours of my employment was a tour of the facility, and on hour 4, I was assigned to to a conveyor belt, where the beheaded, be-limbed and skinned steers’ bodies would travel past me on a giant hook. The guy in front of me had a huge meat cleaver, and his job was to slice the steer down the middle. I had a shoulder length rubber glove, and my job was to reach in and scoop out the guts. I made it through one cow and quit. I was vegetarian for 2 years after that. The only reason I went back to eating meat, was I was on my own, and couldn’t cook. In 1908, the U.S. enacted the Pure Food and Drug Act. The beef industry lobbied the government for an exemption to the act, and won. Beef is not subject to the U.S.D.A.’s Pure Food and Drug Act. People should know that. The U.S.D.A. does inspect and oversee the industry, but with a much lower standard than they do other foods – including meats. I know us meat-eaters aren’t popular here on Rumpydog, but if you do eat meat, you’re best served eating game meat. That’s why I choose Bison over beef. Bison is raised and sold as game meat, and therefore held to a much higher standard. All are welcome here. I’m not trying to stop people from doing anything. I’m trying to make sure people make informed decisions, and choose for themselves whether or not to eat meat and what kind. Oops. Sorry about the HTML error. It’s early. Makes me sick animals are treated like that. We try to do what we can as consumers but this scene is so damn overwhelming. Hard not to turn away, but we (my family over here) won’t. Thanks, Rumpy. You really have to stay on your toes, because there’s no limit to the ways these companies try to fool us. So true. My husband is a fine print man, professionally, and we pay a lot of attention to the hidden agendas. Doubtful it’s ever about animal welfare when deep pockets are involved. Hey Rumpy! I’ve read about the Ag-gag Law. I forgot the association in-charge with it. I think the head directress mentions that the big companies are threatening to remove the business in these states if they do no impose the Ag-Gag law. Honestly, I think it’s a lot of bull. I’ve seen those undercover footage. Sure, it may not stop me from eating meat, but I certainly care about transparency and how these animals are treated. 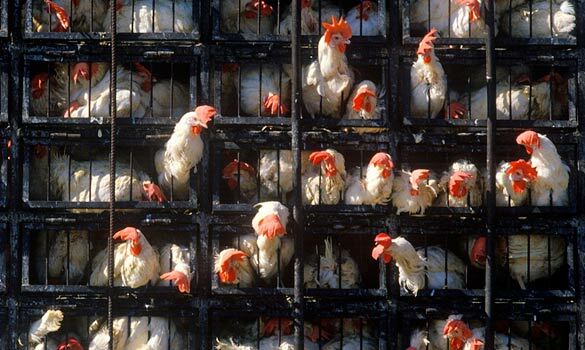 Just because they’re food, doesn’t mean they weren’t living, breathing once! The problem with big agriculture is where there used to be many small farmers, now the industry is controlled by a few large companies. And the power seems to be going to their heads. Agreed! And because of this, they’re over confident that the official of said state won’t easily boot them out. Oh that is just so horrible! When I receive video in my email from Care2 causes behind the scenes type stuff of animal slaughter, I make myself watch as much as I can so I can help educate people on what really goes on and raise awareness to the subject as well. 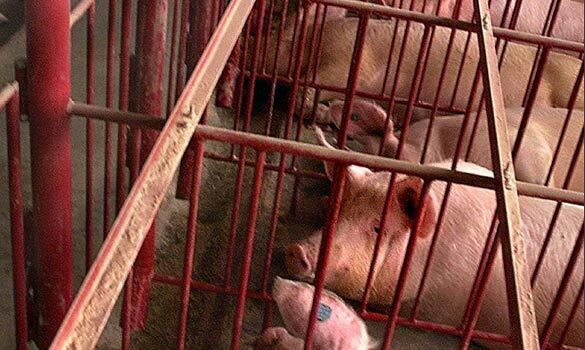 conditions are the same here in NZ, however as far as I am aware there is no ‘Ag-gag law’ as you call it and am sure that there would be a big hue and cry from the population here if they tried to bring something like that in. They do however make it difficult for people to know about how these animals are farmed…………and we do find out tho and in some instances the farmers when caught are prosecuted! This sort of thing is not confined to just the food industry tho as there are things like puppy farming (I’m sure all the readers have heard of that) and to me that is just as abhorrent. At least in the food industry the poor animal is put out of its misery whereas in puppy farming that does not happen and the poor dogs are forced to carry on producing. I guess this may well happen with cats too but not nearly as well known. I prefer fish myself and my husband and I choose to eat that as much as possible. Not knowing is no excuse, we have a duty of care to ‘know’ what we create by buying…no matter how it is marketed! Thanks Rumpy. This (among other reasons, like your OWN health) is why grass-fed, pastured meat and poultry from farms you know and have access to are of the utmost importance. This won’t end unless people stop eating this food (and, no, that doesn’t mean going veg or vegan if you don’t want to). http://yourfamilyfarmer.com is a great example of how animals should be raised for food, eggs and milk. I mean really, even if you’re NOT an animal lover, how could you possibly eat this crap?